CAPTION: Monsanto Mobile Technology Unit is a 53-foot long, 1,000 square-foot interactive display featuring the latest advances in seed breeding, biotechnology and new product development designed to help farmers be successful. The unit will arrive in Chillicothe Thursday, March 5, and will be available for tours Thursday and Friday. The second annual Salute to Agriculture for Livingston County farmers will showcase the Monsanto Mobile Technology Unit, a unique showcase of agricultural science and innovation, when it appears at the Litton Agri-Science Learning Center in Chillicothe, Thursday and Friday, March 5 and 6. The Chillicothe Area Chamber of Commerce has secured Monsanto as the corporate sponsor for this year’s event. The company has sent letters to farmers within a 60-mile radius to invite them to visit their traveling exhibit. Tours for local farmers, seed dealers, ag youth and community leaders will be available from 8 a.m. until 5 p.m. on Thursday and from 7 a.m. until 5 p.m. on Friday. The Chillicothe Area Chamber of Commerce recognizes the vital role agriculture has played and continues to play in our area, state and nation. “We truly appreciate the efforts of those who work to promote agriculture and ag-related businesses and we are pleased to be able to stage this event again this year,” said Martha Berry, a member of the Chamber board of directors, who again is co-chairing this year’s event with Mayor Chuck Haney. The Chamber is excited to have the Monsanto Company come aboard as the corporate sponsor of the event and to bring their unique and traveling exhibit here for two days. “On behalf of Monsanto and Brenda Cockrell, customer relations manager, we want to say thank you,” said Chamber President Diane Garber. Monsanto will also be sponsoring an Ag Day Breakfast at 7 a.m. on Friday, March 6, at the Mervyn Jenkins Expo Center with the Chillicothe Area Chamber of Commerce. Assisting the Chamber with the breakfast will be the ag instructors and Chillicothe FFA Chapter members. The Chamber is requireing the invited farmers of Livingston County to call the Chamber office at 646-4050 with their reservation by noon on Wednesday, March 4. Missouri Director of Agriculture Dr. Jon Hagler will deliver the keynote address for the Ag Day Breakfast at 7 a.m. this Friday, March 6, at Mervyn Jenkins Expo Center as part of the Chillicothe Area Chamber of Commerce Salute to Agriculture. Hagler, a lifelong horseman, continues to operate a small farm near St. James, where he trains and sells Missouri Fox Trotters, the Missouri state horse. Over the past three years, Dr. Hagler served as Gov. Nixon’s principal adviser and liaison on agriculture issues and was instrumental in drafting the governor’s agricultural and environmental policies. Hagler, 41, was raised on a horse farm in Dent County and has maintained his own operation, Cheyenne Farms, since 1997. Since 2005, he has met with farmers in every corner of the state on Gov. Nixon’s behalf to learn about their operations, assess their needs and develop the governor’s agriculture policy. Prior to becoming Gov. Nixon’s agricultural adviser on the campaign, Dr. Hagler served as the senior corporate development officer for the University of Missouri-Rolla (now, Missouri University of Science & Technology). In this capacity, Hagler served as the university’s point of contact with numerous major corporations including agricultural science and research corporations and developed a comprehensive corporate-partnership strategy. 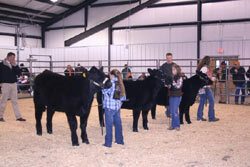 CAPTION: The 2009 North Missouri Prospect Steer & Heifer Show at the Livingston County 4-H and FFA Fairgrounds attracted over 110 head of cattle Saturday at the Missouri Club Calf Association point-sanctioned junior show. The show was held in conjunction with the Green and Gold classic, hosted by the men of AGR, Northwest Missouri State University Chapter. 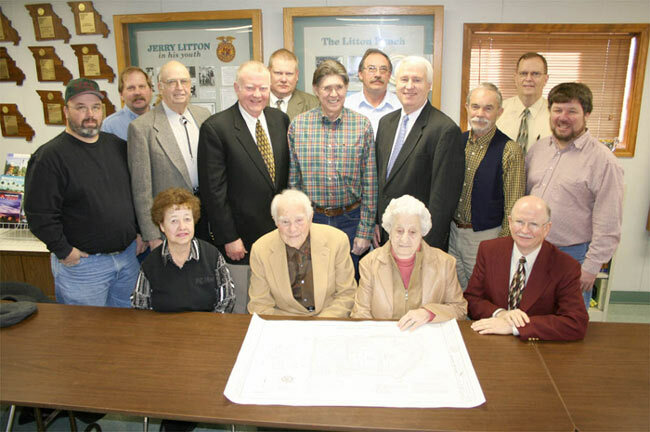 CAPTION: The Jerry Litton Family Memorial Foundation is awarding $500,000 to the Chillicothe FFA Alumni Association to help fund construction of the new agricultural education building at the Litton Agri-Science Learning Center. Pictured are, front row, from left: Randy Constant, R-2 board president; Dr. Linda Gray Smith, R-2 superintendent; Bonnie Mitchell, Litton Foundation secretary/treasurer; Ed Turner, Litton Foundation vice president. Back row, from left: Rusty Black, Jim Grozinger and Leda Schreiner, agriculture instructors; Merle Doughty, Don Chapman Jr., Kenneth Churchill and Jim Summerville, Litton Foundation board members. The Jerry Litton Family Memorial Foundation is awarding $500,000 to the Chillicothe FFA Alumni Association for the new agricultural education building at the Litton Agri-Science Learning Center. The donation, according to Ron Wolf, co-director of the GRTS, is a result of planning completed and a commitment made by the late Mildred Litton prior to her death on Dec. 25, 2008. “The Litton Foundation has been a long-time supporter of agriculture education, FFA and other school activities,” said Wolf. He noted that the foundation has contributed more than $1.4 million to the development of the Litton Agri-Science Learning Center, the Jenkins Expo Center and to the support of student projects. “Many school projects would never have been possible without the initiative, the support and the generous contributions. The Litton Foundation is truly a loyal and committed supporter of agriculture and the FFA,” Wolf said. The Grand River Technical School received a Vocational School Capital Improvement grant in June 2008 for up to $1.3 million to be used on the building. The grant will reimburse the R-2 district half of the total cost of the project. The proposed agriculture building will be 15,000 square-feet and will include classrooms, a shop, laboratory, greenhouse and offices. In addition, a display dedicated to the Litton family will be included in the new facility at the Litton Center. The estimated cost for construction is $2 million. Construction on the agriculture education building is likely to begin this summer. Bid proposals, Wolf said, will be sent out in late March to early April. Construction is hoped to be completed by the summer of 2010. The building will be located north of the parking lot of the Jenkins Expo Center and west of the Rotary shelter house. School district plans are for the agriculture education program at Grand River Technical School to move from the GRTS to the new facility in 2010. The addition to the GRTS will allow the agriculture program to consolidate the facilities already in place at the Litton Agri-Science Learning Center. The move by the agriculture program will provide additional space at the GRTS for existing programs and the development of new programs. The current GRTS facility was built in 1967 for 350 students and eight programs. Currently, the GRTS has over 650 students and 14 programs. CAPTION: The pond at the Litton Agri-Science Learning Center now has two new residents — tame mute swans, donated by Tom Burke, of Platte City, Mo. According to Steve Radcliff, fair board president and Jenkins Expo Center event manager, Burke raises the birds and, while visiting the facility during a cattle show in September, decided the pond should have swans. The birds arrived Saturday. 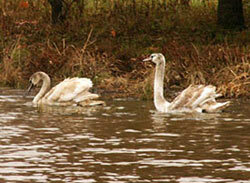 They will stay on the pond until it freezes and then be brought inside the Litton center for the winter. CAPTION: The featured tractor of this year’s Harvest Days was the Ford. There was also a large display of Sears and David Bradley large garden tractors. Harvest Days concluded with the antique and classic tractor pull on Sunday. The featured tractor of the this year’s Harvest Days was the Ford. There was also a large display of Sears and David Bradley large garden tractors. Harvest Days concluded with the antique and classic tractor pull on Sunday. 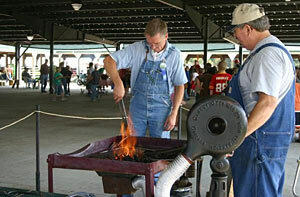 Throughout the fairgrounds were a number of demonstrations including water well drilling and oats threshing. 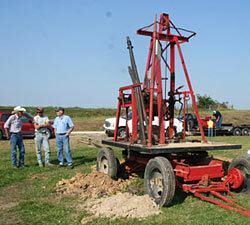 The old-time water well drill was powered by a single horse walking in circles as the equipment drills down. The drill was in operation Friday and Saturday until it hit rock about 15 to 16 feet below the ground’s surface. Through water witching (using a divining rod), it was believed that water was around 27 feet down. The threshing machine is owned by Larry and Mary Grothe. Association President John Meneely said the annual steam and gas association event — which was only the second one at the new fairgrounds — was successful with ideal weather conditions as well as a good number of vendors and exhibitors. CAPTION: The old-time water well drill was powered by a single horse walking in circles as the equipment drills down. The drill was in operation Friday and Saturday until it hit rock about 15-16 feet below the ground's surface. Through water witching (using a divining rod), it was believed that water was around 27 feet down. CAPTION: The Livingston County Fairgrounds were filled with the sights, sounds, smells and tastes of life in the country many years ago during the 22nd annual Old Time Harvest Days. 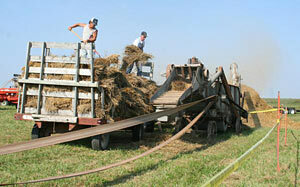 The threshing machine is owned by Larry and Mary Grothe. 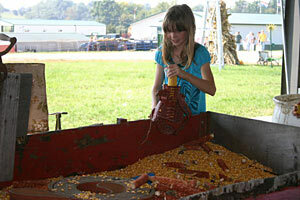 CAPTION: Tina-Avalon 5th grader Marti Mills tried her hand at grinding corn into feed. Steam and Gas Association Old-Time Harvest Days was crowded this morning with area elementary school students. CAPTION: Dan Files of Brookfield and Ed Harper of Browning had a fire burning this morning, creating tools with heat and pressure. After stoking the metal in the blazing hot coals, the shape was pounded out with a heavy mallet to form the handmade tools. Plans would include a 15,000 square foot facility with lab space and classrooms. The ag department would then be moved to the Litton Ag Center. "It would be to our advantage and to the teacher's advantage to have class and labs all in the same spot," said Wolf. He also stated that moving the ag department would free up much needed space at the current school for new programs. The final phase of a expansion project at the Litton Agri-Science Learning Center is nearing completion. Ag Power and Structures and Ag Construction II classes in the agriculture department at Grand River Technical School, are assisting with the construction of a pole building which measures 22 feet by 96 feet. According to Rusty Black, agriculture instructor, the building is the final phase of a three-phase project which began just over five years ago costing an estimated $75,000. Funding was provided through several area foundations including the Browning Foundation, Litton Foundation, McCall Foundation and the Livingston County Community Foundation. The new building opens to the south of the Litton Ag Center and has the ability to divide into several pens. The new building will be used for sheep, cattle and goats. Construction of this building is the final phase of the expansion project. The first phase began four years ago when the hog barn was expanded. The second phase of the project included finishing the interior of the original building which housed livestock. According to Black, now that livestock is not housed on the interior of the building anymore, the construction of this building was necessary. The students, under the direction of Agriculture Instructor Keith Dietzschold, plan to have the building completed by spring 2008. Several businesses and individuals have assisted in the construction of the building. John and Jeremy Williams of At Your Service Construction provided professional insight, guidance, and labor. Keith Dennis of Dennis Construction, LLC laid the underground electric line to the new building, and Lauhoff Construction completed the dirt work for the new building and surrounding area. "All who utilize the Litton Center should thank the students, advisors, and local individuals who have put their time into making improvements to the Litton Center," Schreiner said. "Without this type of support, the Litton Center would not be as successful as it is today." Caption: The new Livingston County 4-H and FFA Fairgrounds is taking shape with the multi-purpose expo center and the cattle building (toward the top of the picture) essentially completed. The bulk of the new fairgrounds project is being funded through donations from four local foundations and the Chillicothe Industrial Development Corporation. Funding from those sources are: Jenkins Foundation, $725,000; Litton Foundation, $400,000; Browning Foundation, $50,000; McCall Foundation, $100,000; and CIDC, $50,000. The new Livingston County 4-H and FFA Fairgrounds is taking shape with the multi-purpose expo center and the cattle building essentially completed. The multi-purpose building, built by Copeland Development & Construction Co., Inc., is 28,000 square feet 8,000 of which will be enclosed and heated and air conditioned. When put to use for the county fair, the enclosed portion of the expo center is where the items formerly housed in the green building will be. The livestock shows will also be held in the enclosed portion. According to Ron Wolf, Grand River Technical School co-director, the wings coming off the the multi-purpose building will house all livestock, excluding horses. There is a walk-way between the multi-purpose building and the cattle barn. The cattle barn was constructed by Morton Buildings Inc. Plans to pour gravel at the new fairgrounds site is scheduled to occur once the ground settles and dries. Wolf reported that the Livingston County fair board is currently working on getting an arena at the new fairgrounds. Also, in the future, the board has plans to construct a horse barn, pour concrete, make a parking lot and possibly construct a storage shed. The Chillicothe Rotary Club will also be constructing a shelter house. 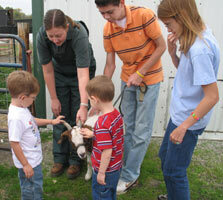 The 2007 Livingston County 4-H and FFA Fair will be held at the new fairgrounds. According to Wolf, several groups have already made plans to hold events in the multi-purpose building and livestock shows are scheduled for the fairgrounds in April. The bulk of the new fairgrounds project is being funded through donations from four local foundations and the Chillicothe Development Corporation. Funding from those sources are: Jenkins Foundation, $725,000; Litton Foundation, $400,000; Browning Foundation, $50,000; McCall Foundation, $100,000; and CIDC, $50,000. The Chillicothe R-2 School District is the owner and operator of the new fairgrounds. Bank Midwest of Chillicothe presented $20,000 to help with building the Livingston County 4-H and FFA Fairgrounds. Bill Everett, vice president and banking center manager of Bank Midwest in Chillicothe presented the check to fair officials on Friday. 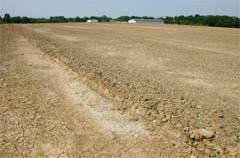 The $1.4 million project underway at the future site of the Livingston County 4-H and FFA Fairgrounds is progressing well. In fact, the huge multi-purpose building (now called the Jenkins Expo Building) is all but completed with three months left before the 2007 Livingston County 4-H and FFA Fair. Citizens Bank & Trust Chairman, Bill Young, has made a pledge of $50,000 from the bank to support the new construction for fairgrounds at the Litton Agri-Science Learning Center northwest of Chillicothe. "Citizens Bank & Trust is proud to be a lead corporate donor funding this project that benefits our county, our school, and our youth," said Young. The project is a combined effort of the Livingston County 4-H and FFA Fair Board, Chillicothe FFA Alumni, and the Chillicothe R2 School District. The money donated from the bank is funding the finishing work, including drainage, of the cattle shed directly east of the Jenkins Exposition Building. The $1.4 million project underway at the future site of the Livingston County 4-H and FFA Fairgrounds is well underway and the huge multi-purpose building and nearby cattle building are nearing completion. The Chillicothe R-2 School Board received an update on the project during Tuesday evening's regular November meeting held at district headquarters. "Things are looking really good," said Ron Wolf, Grand River Technical School co-director. "The multi-purpose building is really massive and it's about two-thirds done." he added, explaining that the building is expected to be completed by the end of 2006. Specifically, the multi-purpose building is 28,000 square feet - 8,000 of which will be enclosed and subsequently heated and air conditioned. When put in use for the county fair, the enclosed portion of the building is where the items formerly housed in the green building at the former fairgrounds site will likely be placed. The show ring will also be placed in the area and the wings coming off of the building will be open and house all livestock, excluding horses and cattle. The cattle barn, located just east of the multi-purpose room is almost completed as well. Wolf said that the walkway between the multi-purpose building and the cattle barn still needs to be finished. Water, sewer, and electricity has already been installed. "The main thing we have left to do in order to have a county fair there is have the arena built," Wolf said, adding that the project will be done sometime over the winter and should be finished by next spring, depending on the weather. The campground is also expected to be completed by that time. According to Chillicothe R-2 School Superintendent Dale Wallace, some of those funds have been pledged on an annual basis for a period up to five years. Wolf said that he has received commitment from a few local banks and announcements regarding their respective donations to help fund the project will be announced within the coming months. The multi-purpose building, the wings off of it and the cattle barn are considered to be part of Phase 1 of the project. Phase 2, according to Wolf, includes concrete work in the cattle barn, construction of the horse barn, and building stalls for it. Wolf said that the temporary plans for the site also includes a new shelter house donated by the Chillicothe Rotary Club. He noted that bids were being taken on that project now and the building will likely go up next spring. The site of the new Livingston County 4-H and FFA Fairgrounds encompasses 16 acres, in addition to the 22 acres currently housed in the Litton Agri-Science Learning Center, which will also be utilized during fair time. Copeland Development & Construction Co., Inc., is the contractor for the multi-purpose building project after submitting a winning bid of $897,982. Morton Buildings Inc., constructed the 280 by 100 square foot cattle barn. While the buildings at the new fairgrounds site have been going up, the ones at the former fairgrounds site, just east of Chillicothe, have been going down. According to Bob Peters, a member of the Livingston County Fair Board's building committee, all of the buildings at the former fairgrounds have been sold to Todd and Bob Rounkles as of Oct. 14. 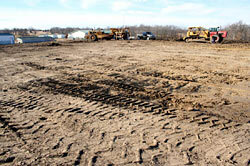 Peters said he was excited about the activity going on in the new fairgrounds site. "We're pretty excited about the project. It's going to be a very attractive facility and will be a great asset to the community," Peters said. out of refrigeration to show the students the progress. 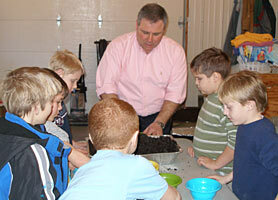 Rosie Smith's class came out to the Litton Agri-Science Learning Center to complete their lesson on planting tulips. 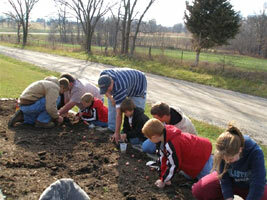 The classes first trip was this fall where they learned all about plants, planting bulbs, and forcing tulip bulbs. The trip in March they got to see the product of the forced bulbs, planted 25 bulbs in the flower bed, and got a special visit with the animals. This trip was made possible by the Litton Center Mini Grant Program. the animals out at the Litton Center. in the Litton Center flower beds. 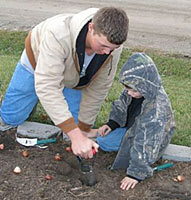 Caption: On November 29, 2006 Mrs. Smith's class along with Junior/Senior FFA members planted and forced tulip bulbs at the Litton Agri-Science Learning Center. Mrs. Smith's class was learning about plants and their life cycles; and with the help of the Litton Center KIDS Grant, sponsored by the Litton Family Foundation, they were able to go out to the Litton Center and put their learning into use. The students will then be able to see the bulbs in the spring in the front Litton Center flower beds. 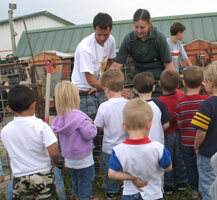 Caption: Preschool students from the Day Dreams Daycare visited the Litton Agri-Science Learning Center on October 4, 2006. 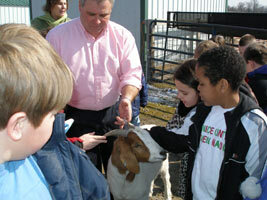 The students were learning about farms in class and came out to see the real thing. While at the Litton Center the high school students gave them a tour. 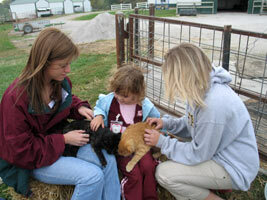 On the tour they were able to pet Betty (the goat), see a heifer and steer, pet Spot (the pig), feed the fish in the pond, and play with the friendly barn cats. All of the students had a great time. Caption: Construction of two buildings at the future site of the Livingston County 4-H and FFA Fairgrounds will begin immediately and several local foundations have pledged over $1 million to assist in funding the project which will be located at the Litton Agri-Science Learning Center. The Livingston County Fair is expected to operate at the new site next summer. shows. Officials compared this area to a combination of the current show arena, cook shack and green building all in one location. On both sides of the enclosed area of this building, will be 100-feet by 100-feet buildings which will house livestock including hogs, sheep, goats, poultry and rabbits (everything but cattle and horses). Morton Buildings, Inc. submitted a bid of $102,343 for a cattle building which was also accepted during the school board meeting. This building will measure 60-feet by 280-feet and will be an open-sided building, comparable to the current cattle barn at the fair. This bid also includes a 60-feet long covered walkway between the multi-purpose and cattle buildings. Also during phase one of the fair project, the existing arena at the current fairgrounds, including bleachers and fencing, will be moved to the new site. According to Ron Wolf, co-director at the Grand River Technical School, dirt work at the site was completed by Crawford Construction who worked on preparing the site and roads. Construction is set to begin immediately. "This is an ongoing project and everything should be in good shape by fair time next year," Wolf said. Four local foundations and the Chillicothe Development Corporation have pledged over $1 million in funds for the project which is expected to cost $1,472,286. Specifically, the Mervyn W. Jenkins Foundation has increased its original pledge of $600,000 to $725,000 for the fair project. The Litton Foundation has pledged a total of $400,000 to the project, with $250,000 to be paid by this July. 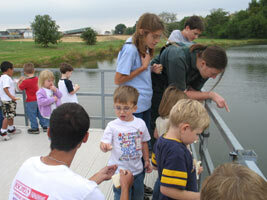 An additional $50,000 will be contributed in 2007, 2008 and 2009. A total of $100,000 has been pledged by the F.M. and Gladys McCall Foundation for the fairground project. With this pledge, $20,000 will be paid by October 2006, and an additional $20,000 will be paid each year until 2010. The Roger A. Browning Foundation has pledged a total of $50,000 for the project and the Chillicothe Development Corporation has also pledged $50,000. CDC will pay a first installment of $10,000 and an additional $10,000 will be paid for the next five years. Additional pledges are also being accepted by the fair board. Board members thanked all those working on the fair project for their continuing efforts. "Within the last month, there has been a lot of work done by a lot of people," R-2 Superintendent Dale Wallace said. Other bids were for the two building projects were submitted by Case Contracting LLC, Par Construction and Septagon Construction. At the new fairgrounds, the county fair and the agricultural department at the Grand River Technical School will use the new and existing facility jointly, and once finished, the multi-purpose building will be made available to the public during the year for rental purposes. The Litton Agri-Science Learning Center currently consists of 36 acres and features a classroom, laboratory and livestock facilities which are used by the agriculture students and FFA members throughout the year. Planning for moving the fairgrounds began several years ago and the fair board voted to pursue the idea in 2004. The fair board leases the current fairground site from the city. The county fair and the agricultural department at the Grand River Technical School will use the new and existing facility jointly and, once finished, the multi-purpose building will be made available to the public during the year for rental purposes. Ron Wolf, Grand River Technical School co-director, spoke to the group on the noticeable increasing popularity of FFA and agriculture classes. Specifically, Wolf noted that in 1971, Chillicothe R-2 had 80 agriculture students, 60 of which lived on family farms. Now, Wolf explained, there are over 200 Chillicothe FFA members and only 30 live on their respective family farms. "The need for agriculture and its related careers are still there, which makes it necessary to provide agriculture education to those students who don¹t receive it on the family farm," Wolf said. The Litton Agri-Science Learning Center currently consists of 36 acres and features a classroom, laboratory, and livestock facilities which are used by agriculture students and FFA members throughout the year. According to Wolf, the future cattle buildings and two small livestock buildings on the fairgrounds will be almost identical in size in terms of square-footage to the ones currently being used at the existing fairgrounds. The multi-purpose building will house the 4-H exhibits as well as an indoor arena where the county's youth will exhibit their animals. "The way these buildings are designed, that can be changed," Wolf said, explaining that the livestock buildings may be used to house different species depending on their popularity from year to year. Both Wolf and Schreiner reported that the plans for the new fairgrounds include adequate space for parking, and plenty of areas for campground and picnic sites. The 2006 Livingston County Fair will be held at the current site on U.S. Highway 36 at the Chillicothe Municipal Airport. You may download the grading plan for the Livingston Co. Fairgrounds site as a pdf file. The file is 555KB, so please wait for it to download if you are on a dial-up connection. If you have any questions, contact Ronald R. Urton Jr., P.E., Shafer, Kline & Warren, Inc., Ph 660/646-9788. 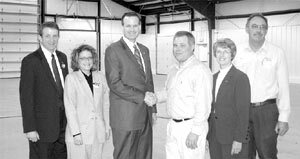 CAPTION: Chillicothe State Bank recently pledged $30,000 to assist with construction of the new Livingston County 4-H and FFA Fairgrounds. The donation will be presented over the next three years. Pictured, from left are, Mark Simmer, State Bank president; Rusty Black, agriculture instructor and FFA adviser; and Robert Peters, fair board member and Chillicothe State Bank vice president. Construction of the new Livingston County 4-H and FFA Fairgrounds received a large boost this week with a generous pledge of $30,000 from Chillicothe State Bank. The donation will be presented over the next three years and represents the bank's continued commitment to making good things happen for youth in Livingston County, officials report. “As a local community bank with strong roots in support of agriculture and youth we are proud to contribute to construction of the new Livingston County 4-H and FFA Fairgrounds,” Mark Simmer, Chillicothe State Bank president said. Construction has already begun on the new fairgrounds located on Hwy 190 next to the Litton Agri-Science Learning Center. The project, which is estimated to cost nearly $1.5 million, will include the construction of a 9,500 square-foot multi-purpose building with a kitchen, a 16,800 square-foot cattle building, and two 10,000 square-foot buildings for hogs, sheep, goats, chickens, and other small animals. 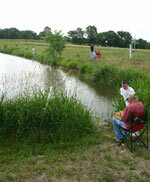 Over 70 adults and children attended the Fishing Derby sponsored by the Chillicothe Optimist Club and the Missouri Department of Conservation on Saturday. 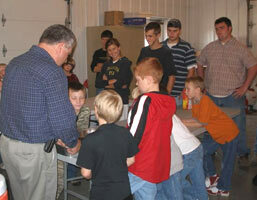 The event was held at the Litton Agri-Science Learning Center. Lunch was served and door prizes were given away.